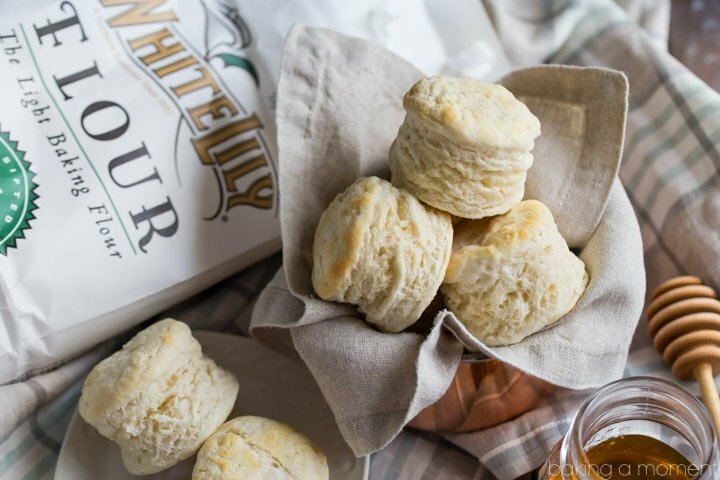 Learn the secrets of making southern-style buttermilk biscuits that bake up tall, fluffy, and light as a cloud. 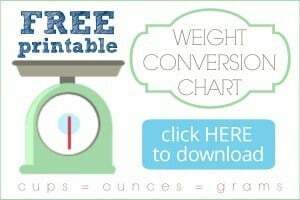 Made with just three simple ingredients! This is a sponsored post, written by me and created in partnership with White Lily Flour. All opinions expressed herein are straight from my heart. I may not have been born in the south, but you’d never know it by the way I bake biscuits. Much of the credit goes to my husband. He’s not a southerner either, but he is truly a connoisseur of buttermilk biscuits. 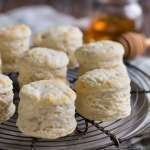 Actually, he’s a lover of all kinds of southern comfort food, but biscuits are a top favorite for him. And one he craves on a weekly basis. Almost every Saturday, from the time we were first married, he’s begged me to make biscuits for his breakfast. And since I love to bake, I always do it. Honestly, it’s not just because I love to bake. It’s also because biscuits are so quick and easy to make. And the final product makes that little bit of time in the kitchen so incredibly worthwhile. He loves to make breakfast sandwiches with them, but he’s also been known to slap a piece of fried chicken in there with some cole slaw. For me, nothing beats a warm biscuit slathered with butter and homemade jam. I can remember years ago, back in my architecture days, I had a client who was from South Carolina. Whenever we would have project meetings, she would always put out freshly made biscuits and jam for all the designers and contractors to nibble on while we talked business. I had already caught the baking bug way before then, so I loved that she had made it her tradition to bake like that every day. It amazed me that she could put out bread, fresh from the oven, on such a frequent basis. I told her so, and that’s when she shared the secret that so many southerners already know. As it turns out, biscuits are one of the simplest things you could ever make. I’m talking three ingredients simple. So when I learned about my husband’s biscuit addiction, I didn’t think twice about diving in and giving it a go. After a bit of practice, I can confidently boast that my biscuits are up there with the best of them. And today I’m going to show you exactly how I make them! When you’re talking about a recipe that only has three ingredients, it’s important that each of those is the best you can get your hands on. Next comes butter. I know a lot of bakers bake biscuits with shortening, but I like to use all butter because I prefer that richer flavor. 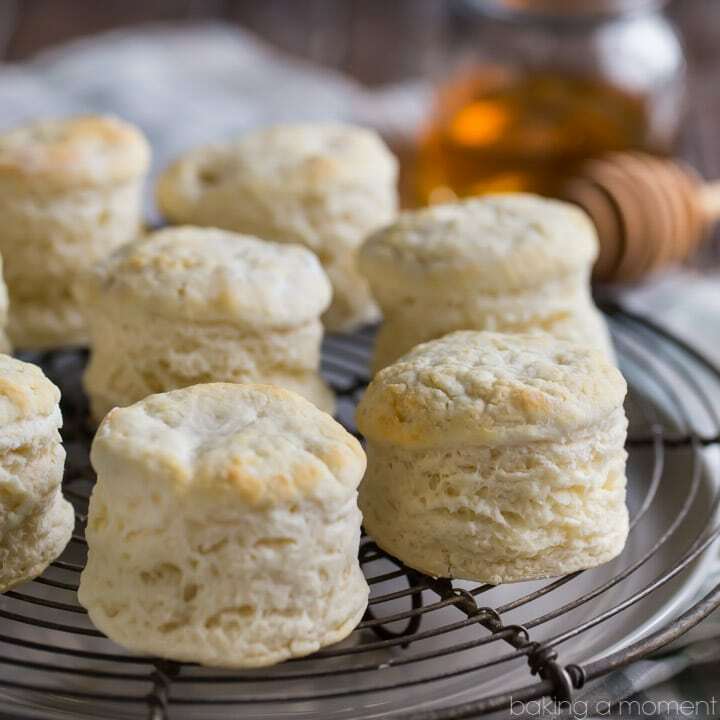 Now the key to a tall biscuit is cold butter, so don’t take it out of the fridge until you are ready to use it. And once you do, you want to work fast. When the cold butter hits the hot oven, it releases steam that makes the biscuits puff up. Cut the butter into the flour using a pastry blender- it works really fast and I like it better than using my fingers because the butter stays colder this way. See how there are some little nubs of butter still visible? That’s what you want. The final ingredient is buttermilk. Again, it’s best if it’s cold. I like to start by stirring it in with a wooden spoon, but you will see that after a little while it looks like there’s not going to be enough liquid for all that flour. Don’t worry though- just get in there with your hands and knead it a few times. It will come together, and be pretty sticky at that! Just dust the work surface liberally with flour so the dough doesn’t stick to your counter. Next, form the biscuits. Flatten the dough to a thickness of about 3/4-inch, and then use a 2-inch diameter cutter to make rounds. I find it’s really helpful to dip the cutter in flour before every cut, just to keep things from sticking. Transfer to a lightly greased baking sheet, and into the hot oven they go. If at any point your flow gets interrupted (to answer a phone call, get the kids a juice box, whatever), pop your ingredients into the fridge to keep them nicely chilled while you do your thing. 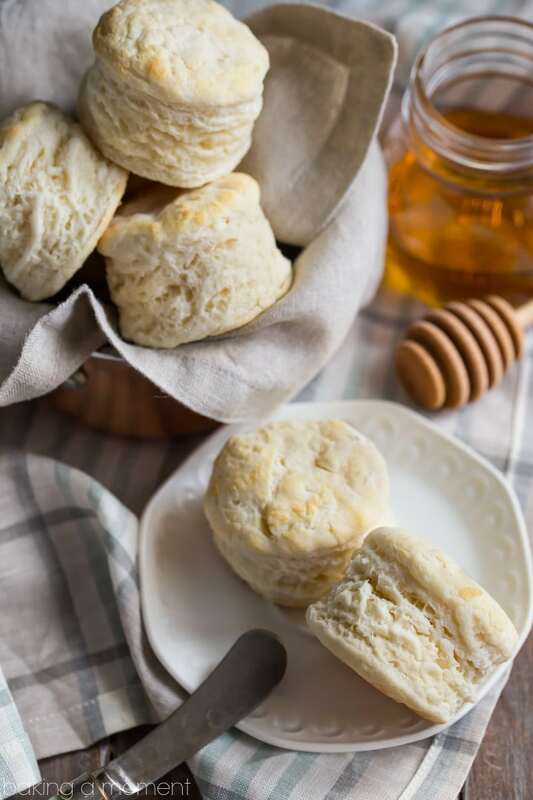 If you’re worried that you’ve taken too long to make your biscuits and things have gotten too warm, put them into the fridge for 15 to 20 minutes, or the freezer for 5 to 10. The colder they are when they hit the hot oven, the higher that steam will make them rise! The less you knead your dough, the better. Overworked dough will produce a tough biscuit, so just a few turns, to make sure all the flour is incorporated. I always keep buttermilk on hand because I use it in so many things (from cakes to waffles to of course, biscuits). But if it’s not a go-to ingredient for you, you can make it. Just stir 2 1/2 teaspoons of lemon juice or white vinegar into 3/4 cup regular milk. Let that sit for 10 minutes or so, until the liquid gets thick and looks curdled. Another option, if you don’t have buttermilk, is to make cream biscuits. You can find the best recipe for that here. 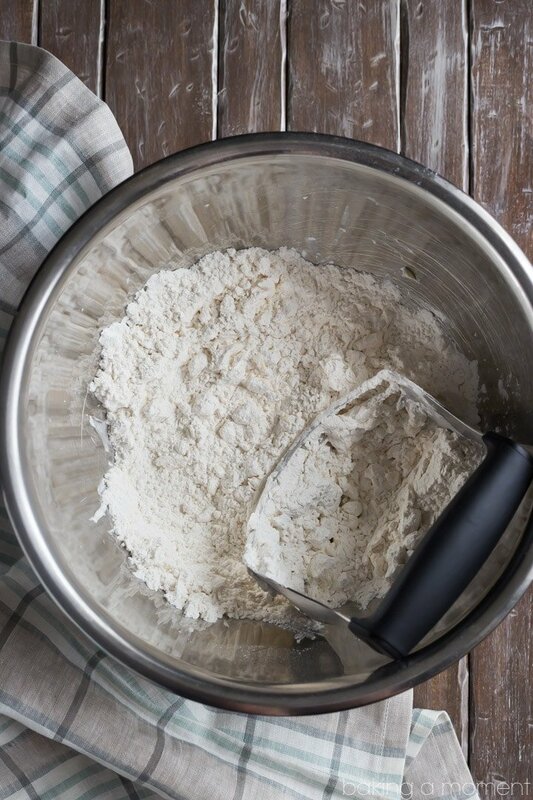 Add a 1 1/2 teaspoons of baking powder and 1/2 teaspoon of salt to every cup of all-purpose flour to make your own self-rising flour. Or check out this recipe for All-Purpose Flour Biscuits. Every time I post with White Lily, I inevitably get comments from readers wanting to know where to buy it. For years, it was only available in the south, but the good news is, they’re rolling it out nationwide. If you don’t already know it, I live in southeastern Pennsylvania, and I don’t have any trouble getting it at my regular supermarket. But if it still hasn’t made it to your favorite market, there’s an easy solution: visit this page, click on the product you want, and you’ll find an option to locate it at a store near you OR order it online and have it shipped to you. Preheat the oven to 500 degrees F and lightly mist a baking sheet with non-stick spray. Cut the butter into half-inch cubes and add to the bowl. Using a pastry blender, cut the butter into the flour until the pieces of butter are no bigger than the size of a pea. Knead the dough with your hands a few times, to gather the dough into a ball and incorporate any flour that may be left in the bottom of the bowl. Dust the work surface with flour, and flatten the dough to a thickness of 3/4 inch. Dip a 2-inch diameter cutter into flour and cut rounds. Place the rounds on the prepared baking sheet and bake for 8 to 10 minutes or until golden. That is how I feel about scones! They are so quick to make, from start-to-finish, and then you have freshly baked goods for weekend mornings. These biscuits are sky-high, and looks so fluffy and flaky! I am dreaming about one of these covered in melted butter, hot from the oven. Lovely! 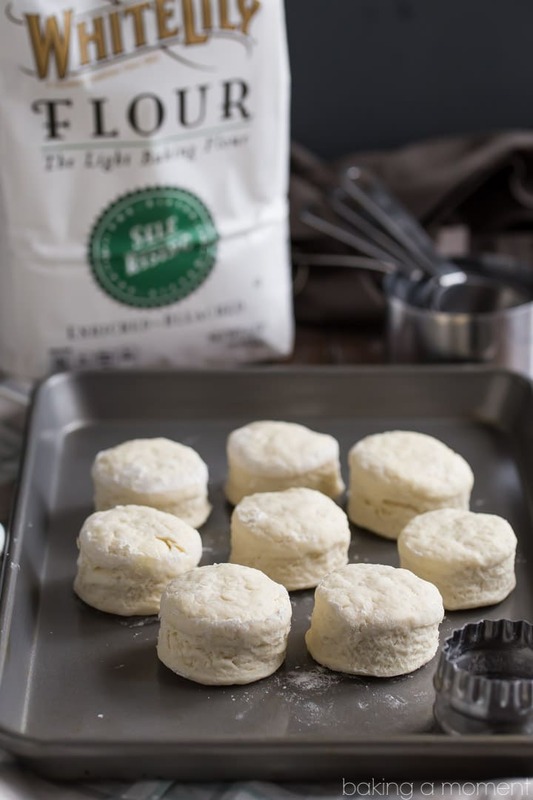 Allie, these biscuits look amazing and I LOVE White Lily flour!!!! I’m making biscuits this weekend!! woot woot! Hooray! Hope you have fun baking biscuits Alice! Thank you! Hi Sharon! Yes, 500 is correct- that is the temperature called for on the White Lily recipe and that is the temperature at which I baked the biscuits pictured here. It sounds like your oven might be off. I would suggest buying one of those little $10 oven thermometers from the baking section of your local supermarket. It’s surprising how far out of calibration our ovens can wander! Isn’t it though? I’m telling you, that flour is so light! Thanks Grace! i’m with your man. there is nothing better than a biscuit. nada. not a thing. other than maybe slathered in butter. and yours look so, so good and flaky! Sounds like you and my husband have a lot in common, lol! Biscuits are definitely a top favorite for him. And you are so right, when they’re done well, nothing can beat ’em! Thanks so much Cathy! Hey Debbi- just follow the instructions at the bottom of the post if you’re interested in purchasing White Lily products. Thanks! Thank you so much Kayle! We were all so pleased with the way they came out. Hope you’re having a great weekend! Holy smokes, these look amazing!! I need to make a larger quantity (like about 70) for a party…. any tips on making ahead, or freezing, storing, etc.? Hey Monica! I do have a tip for you- freeze the cut biscuits on a parchment-lined baking sheet, unbaked. In my opinion, there’s nothing better than a freshly baked biscuit, warm from the oven. So I would pull them from the freezer at least 2 hours before serving, to let them thaw a bit. Keep them in the fridge- you still want them to be cold when they go into the oven. Follow the rest of the recipe directions as written, and they should come out puffy, fluffy and piping hot for your guests! Hi! 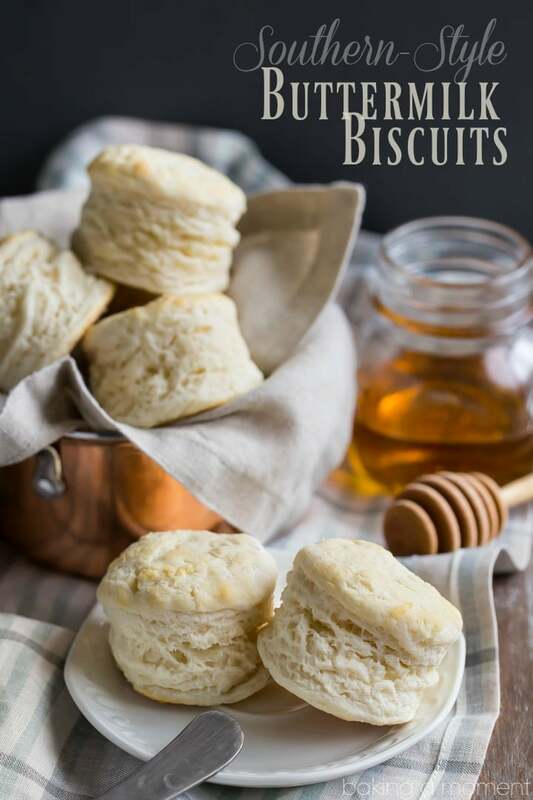 As a born and bred southerner from South Carolina, this is the only recipe we use to make biscuits. Any other recipe is just plain wrong. I will say one tip I learned from my Granny. When you are cutting your biscuits don’t twist the cutter. This seals the biscuit and it will not rise straight up, it will be dome-like. Just push down then lift up. It makes a prefect biscuit to cut open and fill with butter and jam. Thank you for sharing! Happy Baking!! Great tip! Thanks so much for sharing. Happy baking to you too! I find your web site very interesting. Happened upon it while searching for a store that carried cake flour. Thank you for your tips. I had know idea that cake flour would make such a difference. Wish me luck!! Thanks again!!! My pleasure Dola! Glad I could be of help! These look amazing! My son wants me to make them. Hardee’s is the only biscuits that I like, but I think these will now take 1st place in my book! 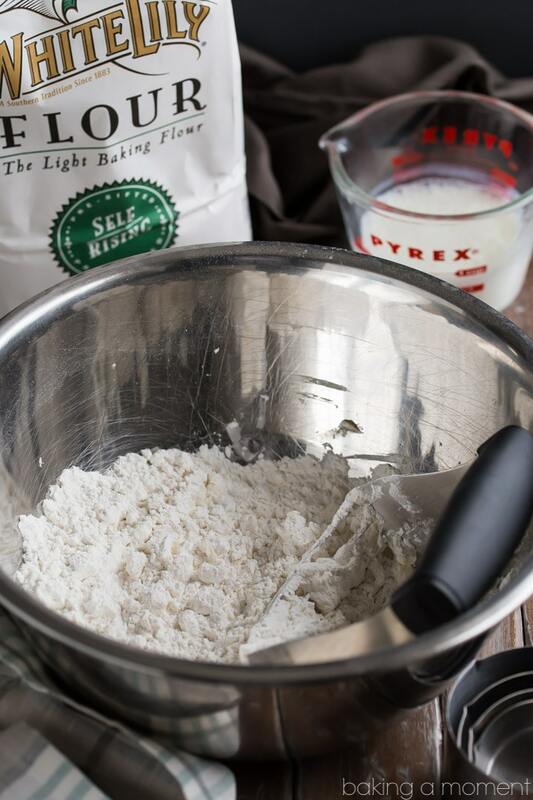 What kind of Self – Rising Flour can you use, when you cannot find White Lilly Flour? I do not pay bills or buy anything online. If it cannot be purchased with cash & in a store, I do without. Hi Susan! So happy you like the recipe. Any kind of self rising flour will do! I’m waiting for my delivery of White Lilly Self-rising flour. So excited to try this recipe. I’ve been making biscuits every weekend for my teenage daughters sleepovers and I just don’t have it down yet. I’m looking for tall, fluffy biscuits. Fingers crossed. Wishing you the best of luck Lori! I had everything I needed on hand and quickly made up another batch within 1o mins, adding 3 tsp of baking powder and 1 tsp salt to the mix. Success! They rose beautifully and were so yummy just out of the oven slathered in butter and Marionberry jam. My husband is so impressed with me right now. Thanks for another 5 star recipe Allie! I promise to thoroughly read your next recipe, before I start. And I do have plans to order White Lily flour, since I will definitely make these again, and again, and again. So easy! So happy it worked out in the end Susan! They sound mouthwatering with the marionberry jam. You’re making me hungry!